Poha is nothing but Beaten Rice or Rice Flakes. 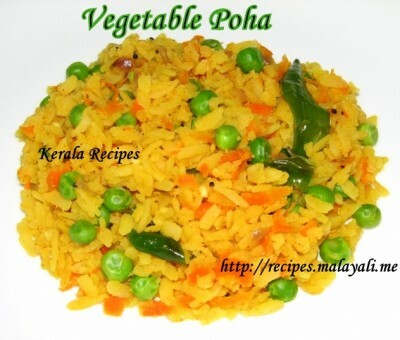 Poha is known as Aval in Malayalam. Vegetable Poha is such an easy dish which can be made for Breakfast, Brunch or Lunch. It is tasty as well as filling and is not as heavy as rice. I make Vegetable Poha for lunch, whenever I have a few veggies lying around in the fridge. My husband loves Poha in any form and he can have it any time of the day. You can add any vegetables like Carrot, Breans, Green Peas, Potato and so on to your Poha. It is definitely nutritious and satisfying. Wash the Poha 3 or 4 times until moistened. Drain and keep aside. If you are using thick Poha, you can soak it for around 4-5 minutes, then wash and drain. Heat oil in a non stick pan and splutter mustard seeds. Add the onions, curry leaves and green chillies. Saute until the onions become translucent. Add the carrots along with turmeric powder, red chilly powder and salt to taste. Cover and cook for a few minutes until the carrots are almost done. Next, add the green peas and cook for a few minutes. Add poha to the pan and mix everything well. Sprinkle lemon juice for more flavor. Remove from stove top after 2 minutes.